Crater Lake Zipline – A 2.5 hour long tree based zipline canopy adventure on National Forest. With 9 zips, two rappels & a sky bridge. Roe Outfitters – Guided fly fishing, hunting, rafting, kayaking, boating, paddle boarding & bird watching trips. Ross Ragland Theater – If you like to watch the occasional play or perhaps listen to some music at a local concert. Epicenter Bowling Center – Bowling, Arcade, Parties, and more! Aftershock Sportsbar & Nightclub – A great place to spend a night on the town! Hanscam’s Bowling Center – Whether you want to join a bowling league or you just enjoy the occasional game, you can do it here! Klamath Country Fair Grounds – Lots of fun events are hosted at the fair grounds. From rodeos to monster truck rallies. You name it and they have it! 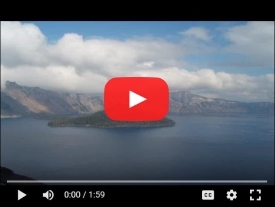 Crater Lake – Truly a site to behold and Oregon’s only National Park! It is the deepest freshwater lake in the US and water is a breathtaking blue color. Lake of the Woods – A great place to go picnicking, camping, boating, and fishing. Collier State Park – This is a neat old outdoor logging museum. Bill Collier Community Ice Arena – A great place to go ice skating. Lots of Local Parks – There are lots of local parks in the area including a new splash park for the kids to cool off during the summer! Klamath County Museum – This is the historical museum for Klamath County. Train Mountain Railroad Museum – This is an amazing place to take the kids for rides on small scale trains. They have miles and miles of rails! The Childrens Museum of Klamath Falls – A great interactive museum for the kids. Klamath Basin Birding Trial – If you enjoy watching the birds, there’s plenty of opportunities for you here! Running Y Ranch – Lodging, Golf, Spa, Dining, and more! Shield Crest Golf Course – Another opportunity for golf enthusiasts! The YMCA of Klamath Falls – Provides opportunities for fitness, swimming, child care, summer camps, and more! Klamath Falls Yacht Club – Klamath Lake provides some of the best sailing conditions in the Northwest! OC&E Woods Line State Trail – This is Oregon’s longest linear park at 100 miles long. Eight miles of it near Klamath Falls are paved but the rest isn’t. It extends east of the town of Bly and west all the way into Klamath Falls. It’s great for hiking, horseback riding, and mountain biking! Wiard Park Splashpad – This is a new free splashpad water park that your whole family can cool off in during the hot summer months. Klamoya Casino – If you like to spend the occasional afternoon pulling the ‘ol “one armed bandit” or trying your luck at the tables, Klamoya is located 22 miles north of Klamath Falls on Hwy 97 N and they’ll fit the bill perfectly. Pelican Cinemas – You won’t want to miss the latest movies! ATV Riding – There are lots of mountain roads and trails for ATV riding. Snowmobiling – There are lots of mountain roads and trails if you enjoy riding snowmobiles. Cross Country Skiing – There are lots of mountain roads and trails if you enjoy riding snowmobiles. Hiking – There are plenty of hiking opportunities in the area. Nature & Wildlife Photography – This is such a scenic area that it’s a favorite among photobugs. Mountain Biking – There are no shortage of mountain biking opportunities here. Klamath Lake – A very large lake that provides excellent fishing and boating opportunities. Williamson River – A local river that provides world class fishing for trophy sized trout! Horseback Riding – There are miles and miles of trails if you enjoy horseback riding! Hunting – This area provides many hunting opportunities. Whether you enjoy hunting small or large game, there’s pleanty of game in the area. Lots of Rivers, Lakes, and Streams – Klamath County is full of opportunities for boating, swimming, fishing, and more! Youth Groups For Teenagers – Many of the local churches host weekly youth groups with activities for teenagers to participate in!